The Help Line is a safe and confidential mental health service for peers, law enforcement, professionals, friends and family members. Toll-free number: (800) 464-5767 & press "1"
You are under 18 years old and report that you are a victim of child abuse. The Help Line is NOT a crisis line. If you believe that you or a loved one could be in crisis, please do not hesitate to call the Statewide Crisis Line at (888) 568-1112 or the National Suicide Prevention Lifeline 1-800-273-TALK (8255). You can also text the Crisis Text Line. Text "HELP" to 741-741. THESE NUMBERS ARE FREE, AVAILABLE 24/7 AND CONFIDENTIAL. Walking in to the Crisis Center at 50 Monument Square in Portland. Individuals experiencing a mental health crisis have immediate access to a team of professionals who are trained to respond to mental health crises 24 hours/day. Individuals in crisis can be seen at the location of their choice as long as the environment is safe for both the client and the mobile outreach clinician. Such locations include the client's home, emergency departments, other treatment facilities, or at the crisis center. 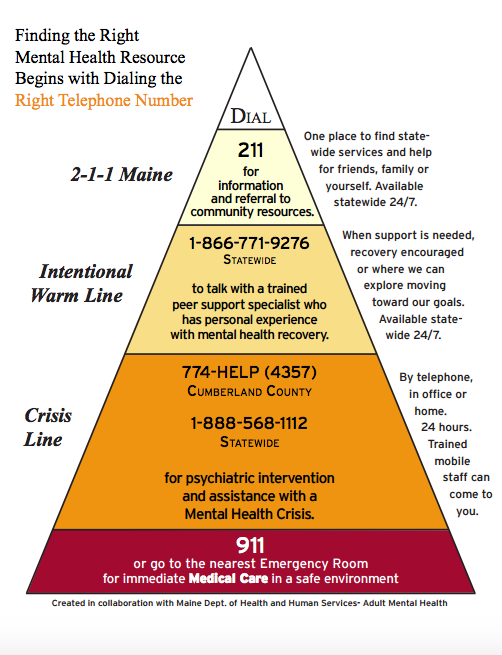 Triage through the crisis center allows quick response to mental health crises, short-term treatment to allow people to stabilize outside of a hospital setting, and facilitated access to emergency room services or hospitalization when necessary. Either click on name to email or call 207-767-3266 and enter the appropriate extension. You can also talk to teachers and administrators who can help get you the help you are looking for. The Opportunity Alliance works with people to build better lives and stronger communities. We provide advocacy, leadership, and support to identify the goals and address the needs of individuals, families, and communities. If you have a problem or just want to talk with another teen who understands, then this is the right place for you! Call, Text, or Email. Check out “Ask TEEN LINE”, find resources in our Youth Yellow Pages, or join conversations with other teens on our message boards.